Calcium is a macronutrient for plant growth and development as it takes part in many physiological and metabolic processes. But, Ca also acts as second messenger for making intracellular stimulation under different abiotic stress conditions to give protection. Abiotic stresses cause nutritional, hormonal, metabolic, and physiological disorders result in crop loss. In this condition, plants suffer from acute oxidative damage caused by excess ROS and disruption of antioxidant defense system. Apart from being toxic, ROS also gives signal to mediate stress tolerance governed by the signal from Ca. Therefore, stressor-induced cytosolic Ca involves in protection response through activation of stress tolerance gene and plays vital role in antioxidative defense response. Hence, many research reports suggested that exogenous Ca increases the plant tolerance against abiotic stresses and stimulates different physiological and metabolic processes, which further increase crop production. 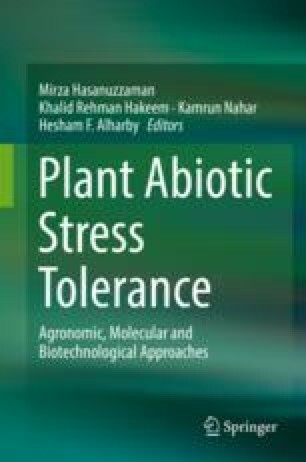 Hence, in this chapter we focused the role of Ca against devastating effect of abiotic stresses in plant growth, development, physiology, and yield. Our aim was to accumulate the recent information regarding the advances turn out in researches that focused the Ca-induced stimulation of plant growth and physiology as well as abiotic stress tolerance in plants.